Catesby's Trillium Trillium catesbaei named for Mark Catesby (1862-1749). Catesby was born in Eastern England in the town of Essex. During the first half of the 1700's he traveled much of Eastern North America. Influeanced by a his friend, naturalist John Ray, he studied natural history in London in 1712. Eventually moving to America he began traveling and collecting seeds and botanical specimens. Between 1731 and 1743 Catesby created the first published account of the plants and animals of North America, Natural History of Carolina, Florida and the Bahama Islands. Catesby made the colored, drawings and etchings of plants for this publication, himself. Catesby's Trillium is found only in the Southern states of Georgia, Alabama, Tennessee, South Carolina and North Carolina. I have found them on the Short Line Trail in Tallulah Gorge State Park in Georgia and along the Little River Road in the Smoky Mountains National Park. Generally they can be found in many mountain areas of the Southern Appalachian Mountains. As I study I learn. According to the USDA http://www.fs.fed.us/wildflowers/plant-of-the-week/trillium_catbaei.shtml based on recent genetic research trillium species now belong to the family Trilliaceae. Check out the web site to learn more. 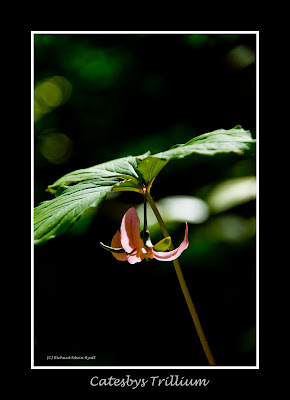 In the mean time I will continue the research on families of Trilliums and hopefully bring more information to light. Here again, I think it may be differing botanist and there is an ongoing argument on this subject. This blog and photos in part or in whole may NOT be reproduced in any electronic or printed medium without prior permission from the author. For information on reproducing any part of this review (or any images) please contact: Richard Edwin Hyatt.